Cramps, bloating, crazy-making mood swings. Totally typical, right? Wrong. PMS is the product of hormonal discord. It’s NOT something you should expect to be part of your period. In fact, it’s a warning sign that something is off in your endocrine system. But there’s good news: simple nutrition and lifestyle strategies can bring your hormones back into balance. If you’ve been suffering from period problems—including severe PMS, heavy or irregular periods, cramps, bloating, mood swings, irritability, migraines, weight gain, or acne—you can put your symptoms into remission simply by shifting how and when you eat and how you support you body with supplements. PMS isn’t something you should have to endure on a monthly basis. You can, should, and deserve to live a PMS-free life! And the secret to that PMS-free life? It’s all about eating the right foods and taking the right supplements taken at the right times during your cycle. If you’re here, I’m guessing you already know that the most common “treatments” for PMS (like hormonal birth control) either don’t work or make the root causes worse. They also come with lots of unwanted side effects. You’ve probably tried a bunch of other things, too: teas, tonics, and more. And yet you’re still plagued with monthly misery. So what gives? It all comes down to one (very) common endocrine imbalance: too much estrogen and too little progesterone. Why are so many of us high in estrogen and low in progesterone (and feeling the effects of this imbalance every month)? Blame it on life in the modern world: micronutrient-deficient diets, chemical exposures, and sky-high stress that elevates cortisol levels all combine to form a perfect, hormone-disrupting storm. But estrogen dominance can be addressed with lifestyle changes, including when and how you exercise, what and when you eat, and how your self-care routine. Magnesium – Many women are deficient in magnesium because of our on-the-go busy and stressful lifestyles. Magnesium helps balance your 28-day hormone cycle, ease bloating, encourage good sleep, and alleviate anxiety. B6 – B6 helps your body produce more progesterone. Progesterone deficiency can make PMS-related symptoms worse by exacerbating estrogen dominance, which is when estrogen in the bloodstream is high relative to progesterone.. Probiotics help the estrobolome metabolize estrogen. Omega 3 fatty acids and vitamin D3 both help promote hormone balance. Vitamin D acts as a master hormone in the body, and healthy levels of vitamin D keep the entire hormone system stable and balanced. Omega-3s are essential for mood stabilization and for reducing cramps. Vitamin E – This vitamin specifically helps with premenstrual breast soreness. As an antioxidant, it protects breast tissue from inflammation. Vitamin C and Alpha Lipoic Acid – Both compounds help the liver break down excess estrogen. Calcium – This nutrient will help with the mood swings, fatigue, headaches and pre-menstrual acne. These micronutrient combinations are the non-negotiable micronutrients every woman needs (whether you’re on the pill or not) to keep your hormones healthy and happy. 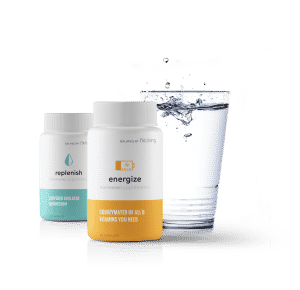 After researching these essential micronutrients for over the past 15 years, I decided it was time to create five formulations that would deliver these to you every day. I recommend that women who are experiencing period problems start by optimizing their micronutrients because this helps heal and balance the endocrine system at its core. If you incorporate these micronutrients and are still experiencing PMS and other problems, I recommend specific herbs. In most cases, you will only need the micronutrients (and not the herbs), but if you do opt for herbs, remember that these are powerful compounds. Use them only in specific situations and always consult a trusted healthcare practitioner on dosage and timing. Vitex – This powerful supplement has been used by women for a long time. Vitex increases production of hormones in the luteal phase and offsets estrogen dominance by supporting your pituitary gland to make more progesterone on its own. Dong Quai – This adaptogen is known as a general tonic for all women and called the female ginseng. Dong quai has muscle relaxing effects and is pain relieving for all those pre-period cramps and aches. Important note! This powerful supplement should not be used during pregnancy, breastfeeding, or if you have a family history of female cancers. So now that you know what you’re missing, it’s time to get it all back. But how? First and foremost, food is your foundation. No single supplement can solve your PMS alone. But, there are some key supplements that will, when used in conjunction with the FLO protocol (particularly the specific foods that support your body during the luteal phase), help speed alleviation of PMS symptoms and prevent future suffering. Once you have your PMS-fighting foods sorted out, as well as your PMS-preventing nighttime routine and PMS-banishing morning routine, you can start with the natural supplements. Whether you’re trying to get rid of pesky PMS, offset the effects of synthetic birth control hormones, improve a diagnosed condition like PCOS, Fibroids, etc, or improve your fertility, making sure you’ve optimized key micronutrients make a good “insurance policy” against hormonal discord and all the crummy symptoms that come with it. Hi, I love the work you’re doing & thanks for the comfort you’re bringing to women worldwide. I live in Germany & as I understand do not have access to your supplements yet. So if one is to out together a plan based on the above suggestions, what frequency & quantity should we aim for? For example: how much of Dong Quai, shitake extract, Omega 3, Vit D3, Vit B6 – to take & how often? My wife suffers with endometriosis and PCOS along with the side effects of both. Is there any specific protocol needed when taking the supplements? Specific micro nutrients in specific quantities at specific times in the cycle? Or is it simply a case of the same quantities each and every day? Are there any simple DIY methods of measuring progesterone and / or estrogen or the difference? I feel part of the problem is knowing how big and therefore what measures should be taken to address the imbalance. Any advice would be most appreciated. I know rest is often needed as fatigue is common, but is exercise more important? Furthermore, sleep patterns; should a strict routine be adopted? Does irregular bed time and waking have any detrimental effects? Sorry for all the questions – I’m not personally going through it but have to to do something to help her out. We would love to speak with her about all the things she can do! There is so much. You can start by picking up a copy of my book “Woman Code”. I outline a lot of the important things to consider when dealing with PCOS and other hormonal imbalances. She will also find a lot of tools and steps to implement in there!